"Let me put this as plainly as possible. 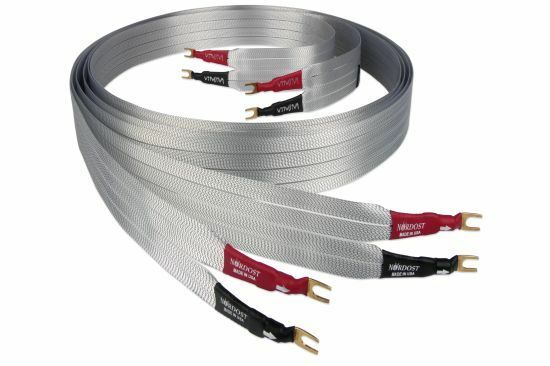 The Valhalla system from Nordost is the least colored and most neutral cabling ever to hit the marketplace." "A triumph, pure and simple." 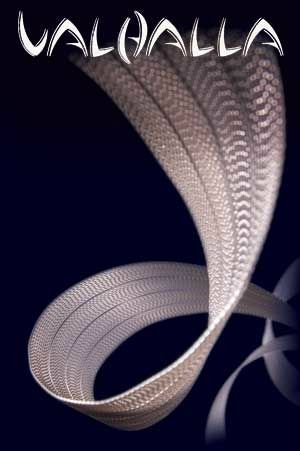 Nordost Valhalla speaker cables have reached even a cult reputation among some audiophiles. They’ve been used successfully in many reference systems and typically they’ve been one of the most used speaker cables in numerous high-end events. 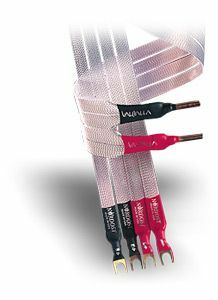 Valhalla is a flat cable including two flat lines of silver for the both poles of signal. The cable pair which I had for the test had only banana connectors and its length was 3 meters. The price of the cable is 10.360 euros. Two meters version is naturally clearly cheaper. The over-all impression of the look and quality was very high and personal, although the width of the cable (approximately 10 cm) may cause a bit “strange” feelings. On the other hand this kind of cable is very easy to locate for example under carpets! Nordost Valhalla had quite the same strengths as Bertram Proxima Silver. It could deliver extremely fast and transparent sound! Its ability to deliver micro details like tiny spatial reverberations of the stage and concert halls was nothing but stunning. It was also very easy to get live concert feelings with these cables. Actually Valhalla might well be slightly the best cable on this feature. The highs and mids were also very clean and natural-like. The cons lied on the other side. The bass was very dry and well controlled, but also lacked some energy. The spectrum of tone colours seemed to be slightly restricted and there was less “flesh on the bones” effect when Valhallas were used, probably at least partially because of the slight lacks in the bass region. So, the critical analysis of instrument tone colours and bass energy revealed that there is still space for further development. Nordost Valhalla seemed to be the most double-faced cable of the test. In some sonical areas it delivered the best or equally best sonical results, in the other sonical areas it had the clearest aberrations, although the differences may still be quite subtle for many audio enthusiasts. Each speaker cable of this test can take you into Audio Nirvana if your equipment and preferences allow it! The final choice is vitally dependent on setup, preferences and listening abilities of each audio enthusiast. This means (again!) that there is no single truth for every case. Of course this means also that every audiophile must test the speaker cables by himself. Anyway, there are certainly a lot of features which will be the same or almost the same despite of the previously mentioned system dependencies. This was also why I wrote this article. So, probably it is not necessary to test all these cables again but only to test the pairs which fulfil one’s requirements most probably. What will the best speaker cables then do? Actually they will do nothing but transmit the information with minimal distortion. Additionally they will help in concentrating more on music and forgetting for example all the stressing feelings. Because of this and the most solid performance the Transparent Reference XL (MM tech) became my favourite!